Our classes are offered by prescription of the Doctor and are often a part of patient recovery programs. Pre-gym: Rebuilding your bio-dynamic structure is crucial to recovery. While you repair structural instabilities within your body, you must also gently strengthen your muscles and teach them to advance correctly toward a full range of motion. 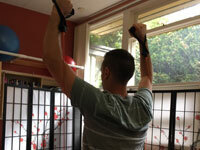 With that in mind, we have designed a basic exercise program emphasizing posture, muscle usage and mental focus. Pre-gym consists of four workouts and a postural practice essential for learning how to push, pull, bend and squeeze in a way that builds confidence in your abilities and supports your body. The program is taught at the clinic in five sessions. After that, we ask patients to commit to practicing the program on their own for three months. Please note Pre-gym is therapeutic — meaning you can’t do these exercises and also train for the Olympic weightlifting championships and expect to speed your recovery! Hello, Body: This course is the first day of Pre-gym and a stand-alone class. Consider it a meet-and-greet with the supporting structures of your body. Students build a connection with the muscles that help hold them up and create a stance that fosters better stability and alignment. They also arrange their muscle tension and breath to increase oxygenation, blood circulation and positive awareness of the body. 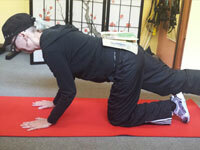 Hips have Power Potential, check out the article in our blog.